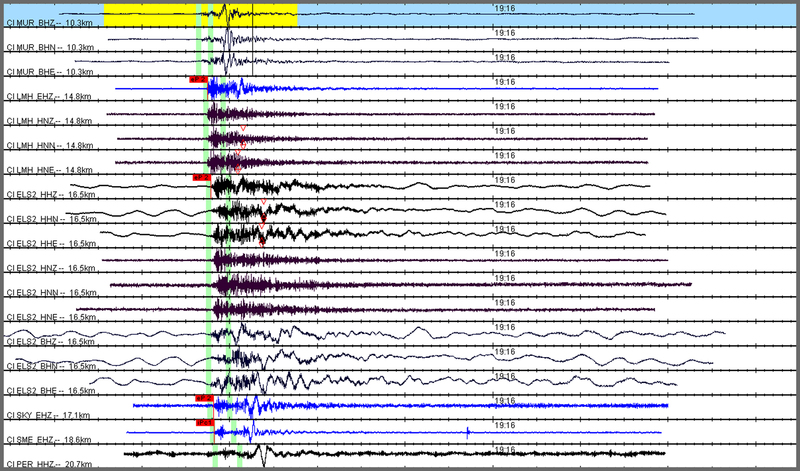 The energy shown here is from a quarry blast located within the SCSN boundaries. Due to mining operations in Southern California we commonly detect blasting that is used in mining operations. Quarry blasts often show a “ringy” (long duration) and low-frequency S-wave making them easily separated from typical local events. An interesting feature of quarry blasts is that the first motion of the wavefront is almost always “Up” or compressive. This is due to how the blast waves are formed in the first place. They start at the surface and the explosive energy is shot down into the ground compressing it outward. Because almost all quarry blasting is performed the same way, using the same methods, quarry blasts tend to look very similar to each other, with variations due to local geology.